​Alki families buy retail gift cards through our program at face value. Pay $100 for a $100 gift card. Each retailer offers a discount to us at 1-13% less than face value. The difference between face value and what Alki PTSA pays = our fundraising earnings. Why Use the Alki Gift Card Program? ​Help Alki PTSA raise money without selling random, unwanted, overpriced “stuff” to family and friends. No unnecessary spending; families spend their planned household budget at stores they already frequent. Families can use gift cards to pay at checkout, just like they would use a credit/debit card, but without the fraud risk. Earnings add up fast! 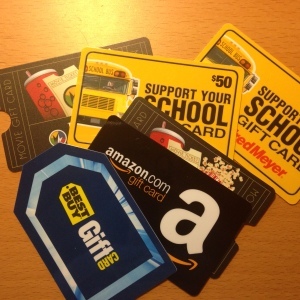 If everyone purchased a $100 gift card to Fred Meyer, the PTSA would earn approximately $3000. Print, complete, and send both forms below to school with your student.